Amazon announced a series of new products but hidden among the new products is a new feature that will really get a lot of people onboard to not only Fire TV but for Amazon Prime. The new feature? Offline viewing of Amazon Prime videos. Previously, the only way to watch Amazon Prime videos was to stream them. 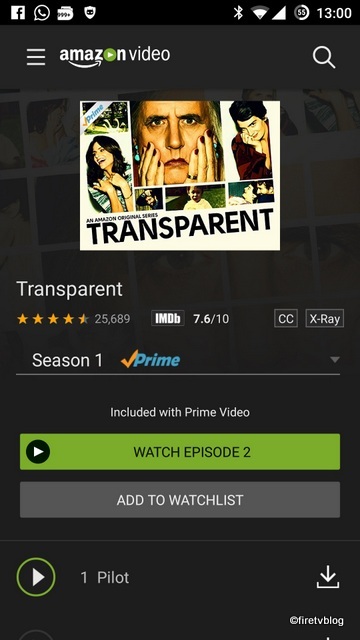 To watch any Amazon Prime or any videos through offline you had to buy or rent it. Only then will you be able to download the video and watch without an Internet connection. After this announcement, you will now be able to download Amazon Prime videos for offline viewing. 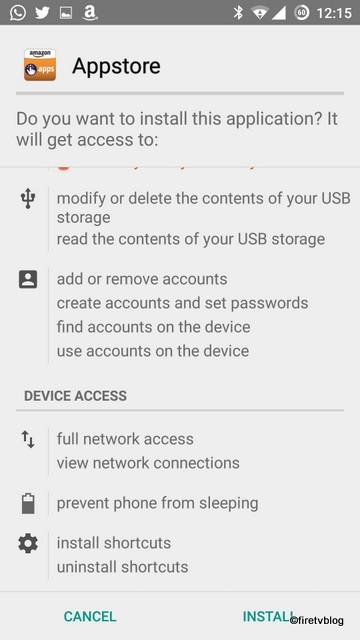 (edit) This feature was previously only available to Amazon Fire devices. 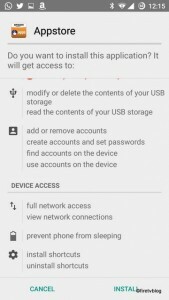 Now, this has been enabled for Android and iOS devices. 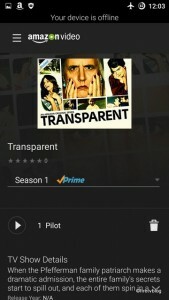 Note that not all Prime videos are available offline. Amazon is working closely with content owners to obtain rights so that you can view these offline. Before you can download the video you want to watch offline, you need to download the Amazon Video app. If you have a Kindle Fire, you can download this app through the Amazon App store. This app is not found on the Google Play or Apple App store. 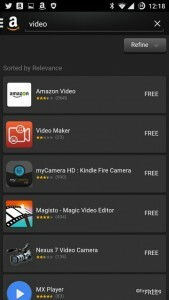 Next, follow the instructions and download the Amazon Appstore. Open the file that downloaded called ‘AmazonApps.apk’. It is an executable file to install an app. 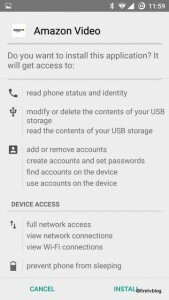 You will get the below screen asking you to install the app. If you have problems clicking the install button, you will need to disable any screen filter apps such as a blue light filter in order for it to work. 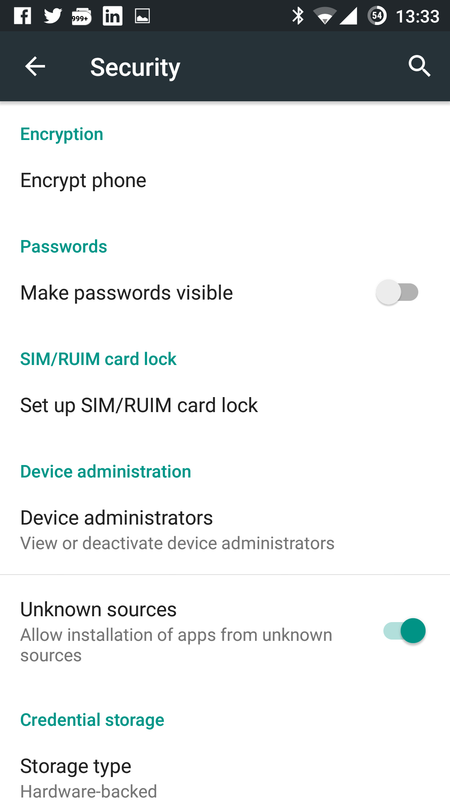 If you still get an error, go to phone settings -> security -> enable ‘unknown sources’ which will allow you to install apps from unknown sources. 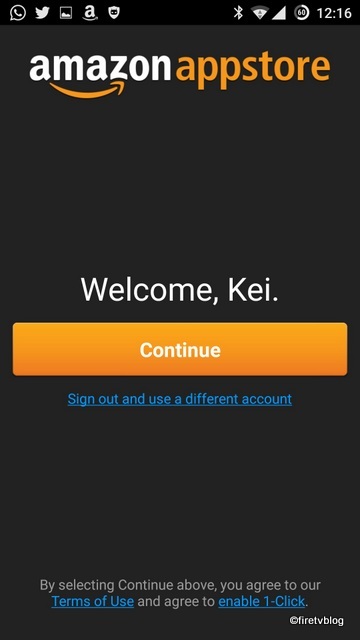 After a bit, you will get to the below screen asking you to sign into your Amazon account. If you already have an Amazon account from Amazon Shopping, the same login will be used. Click the ‘sigh out and use a different account’ link if you want to use another account. 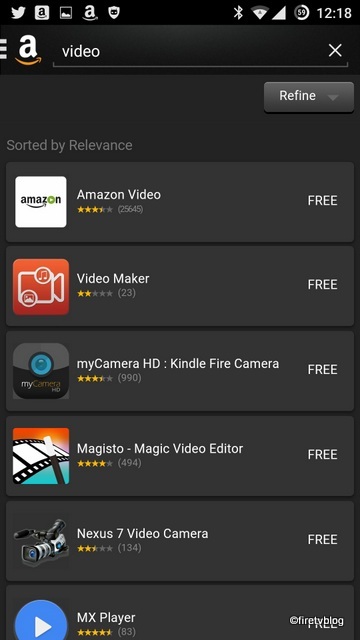 Once inside the Amazon Appstore, search for the Amazon Video app. It is a free app with the below icon. 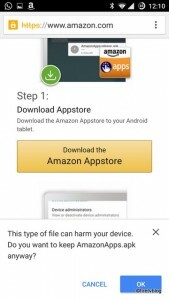 Click install and go through the same process as above when you installed the Amazon App. Once installed, open the Amazon Video App. From here, you can navigate through Prime videos. If you see a download icon next to the video, it means you can download it for offline viewing. Make sure you are on WiFi connection when you download it. 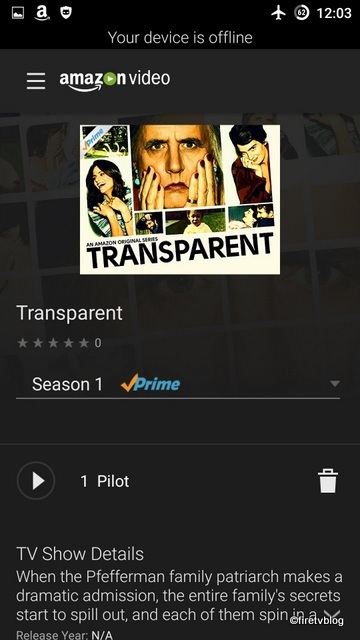 I did a test by downloading the Pilot for an Amazon Prime exclusive series, “Transparent”. After I downloaded the Pilot, I turned on Airplane mode and the play icon was displayed. 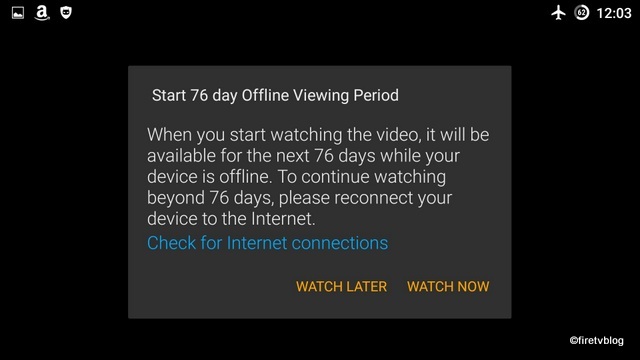 I hit play and I get a pop up saying that I have a 76 day offline viewing period. Seems overly generous unless you are going off on a long boat ride across the Pacific! Once you are done, you can simply delete the video from your account. 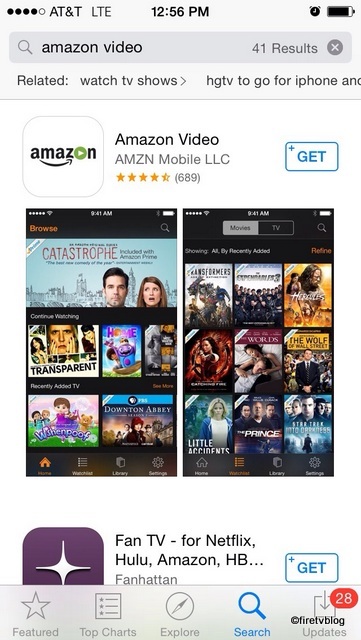 To watch Amazon Prime videos offline, you simply install the Amazon Video app from the Apple App store. 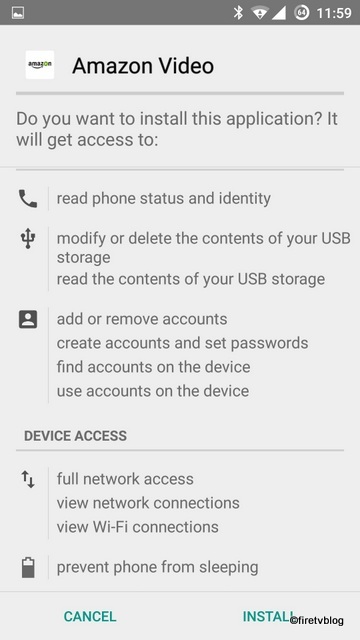 Once you install it, you can follow the same instructions as we have for Android.